What is the hold-up here? It's data, not a box. What is the point of Kindle if it's not quicker than paper? 5つ星のうち5.0Read this. Then read it again decades later. In high school I would have told you this is my favorite book. I just re-read it 2 decades later. And I realize that I grasped about 20% of it at the time. Maybe. Something about the meandering philosophical flow captured my imagination at the time. But reading it now, as a father, I grasp the concepts underneath. I don't readily admit this but I wept at the end. Then I read the afterward and totally lost it. Beautiful, courageous work. Looking at the reviews here, this book is loved by hundreds and reviled by a small percentage. I wonder what causes so much passion? It's wonderful that we have, among those who gave the book just one star, so many people who are so far above it intellectually -- too familiar with philosophy, too personally enlightened, perhaps -- to find any value in it. But I would like to point out to the subset of our best and brightest, those who tell everyone else not to waste their time reading it, that just because you got nothing out of the book doesn't mean no one else will. 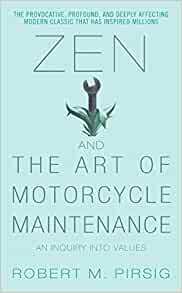 One of the complaints I see here is that there isn't much of the title's Zen nor much motorcycle maintenance, either -- and I note that the author says something about this in his introduction, so it must be true, right? -- yet I believe there is plenty of both. If the reader is expecting an introduction to Zen or a How To manual on motorcycle maintenance, those will not be found. It's not even the author sharing his enjoyment of either of the two fields with his audience. But the themes that run throughout the book explore many of the same ideas the Buddha did, and several concepts important to motorcycle maintenance that will not be found in manuals are discussed throughout the work. But the title really represents the duality that Pirsig puts under his microscope: Zen represents the hippie "go with the flow" attitude that is contrasted to the "slice and dice" schemes of technology, via motorcycle maintenance. And in the end, the title doesn't say just motorcycle maintenance; it's the "Art " that's critical, because one thing the book is aiming for is to show us that the science of technology is an art -- or at least should be an art -- and that the two ways of looking at life don't need to be in opposition, but can be quite naturally blended, to the benefit of all concerned. It might seem like the novel is caught in its time, with language about those who see things as "groovy" vs. "the squares" but the dichotomy between the two has been under discussion in various forms for centuries: romanticism vs. empiricism, passion vs. logic, science vs. religion. The same split is found today underlying two sides of the debate over climate change. If the book is not approached as being literally about Zen and motorcycle maintenance, but as using these as stand-ins for concepts that can be much larger -- or even much smaller -- there is a lot to be gained here. Another complaint is that the protagonist is not sympathetic, but that's because this isn't a novel written from the romantic side, nor, really, the empirical side -- it's not even a novel, though it reads a lot like one -- it is a true-enough tale of relationships between two related men, and a father and a son, and a road trip that carries with it time for plenty of slow discussion of philosophy. The book takes its time putting the pieces together, and the author isn't trying to win our love -- if you can approach the book on its own terms rather than with a whole load of expectations about what it should do and how it should do it, you may get something out of it -- but to truly enjoy it, you've got to go with the flow, you know? I know I get a lot out of it every time I read it. I love road stories, and this one is paced just like a real long-distance trip, with long stretches of time to think things through interspersed with short breaks for taking care of the business of life. That what's going on in the environment, relationships, and other encounters reflects what's being thought through in the long stretches is a small bonus. The writing is clean and evocative, enjoyable. For the most part, the carefully constructed introduction to all the elements needed to understand the philosophy is gentle enough to be clear and not overly taxing, at least until the deepest parts, which can be hard to follow (and for good reason). The elements of psychological mystery captivate me each time. I first read ZAMM the year it was released, in the mid-70s, and have read it at least every five years since then, and each time I thoroughly enjoy it. The first time through, I could not follow the philosophy all the way down into the descent into madness it brought on. Five years later -- with time for the ideas to be examined through my own life -- I got it, even agreed with it. This time, this reading, is the first time I ended up doubting the validity of the greatest philosophical insights the story offers. Ironically, it's my deepening understanding of Buddhism that changed my mind. There really is a lot of Buddhism in this book, and not specifically Zen, either, but the deepest themes common to all forms of Buddhism. The questions about the wisdom of dividing the world up into a duality of the physical vs. the mental, of seeing ourselves as somehow separate from everything else, these were explored by the Buddha, too, though the framework he used to discuss these ideas was -- obviously -- nothing to do with motorcycles. In Dependent Arising he, too, considers how it comes to be that we split the world in two. "Name and form" he calls this split, and later thinkers have described what he was talking about as the same subject-object division that Pirsig is mulling over in ZAMM. The Buddha, though, says that it is "desire for existence" -- not quality -- that, to borrow Pirsig's phrase, "is the generator of everything we know". I tend to agree with the Buddha because I can see in our lives, and through our sciences, what that desire for existence is and why it drives us to divide the world up the way we do, and exactly how it leads us into trouble. I can't say the same for Pirsig's metaphysics, but that doesn't stop me from deep enjoyment of the book. I hope to have another half-dozen five-yearly reads, if I'm lucky, and -- who knows -- maybe I will come around again to see it the way he does. It was with a bit of trepidation that I started this book, being that there was a lot of hype about it and the assumptions I had made from this hype and what the 'Zen' part of its title implied. My concern being that I didn't want to set myself for disappointment if the book didn't live up to the (very) high expectations I had. I must say, this book is very dense and it was not an easy read... for me at least. Intermingled with the story of the father-son duo traveling through several states on their way West, there are many inner monologues where we learn A LOT about ancient philosophy and how the relentless pursuit of understanding Quality and Truth by the father affected his life and those around him. I had to make a point of finding a quiet place AND a quiet time to read this book just in order to keep up with it. I think that to categorize this book and give it a "grade" without the benefit of having enough time to thoroughly "digest" it is a nearly impossible task to achieve, but the one thing I can say is that I feel that I learned a lot more about philosophy than I thought I was able to, mostly because of the way ideas and terms were described by the author. I also enjoyed how the relationship between father and son was developed and how it all came together in the end, by which time I was reading as fast as I could, barely able to contain my curiosity!